Thursday 26th May 2016, is National Sorry Day, which is a day for remembering the mistreatment of Australian indigenous people who were forcibly removed form their families and communities. The first Sorry Day was held in 1998, a year after the tabling of the report Bringing Them Home; the result of an inquiry into the removal of Aboriginal and Torres Strait Islander children from their families. Holding a national yearly commemoration of the impact of these policies was one of the recommendations of the report (source: Sorry Day and the Stolen Generations). 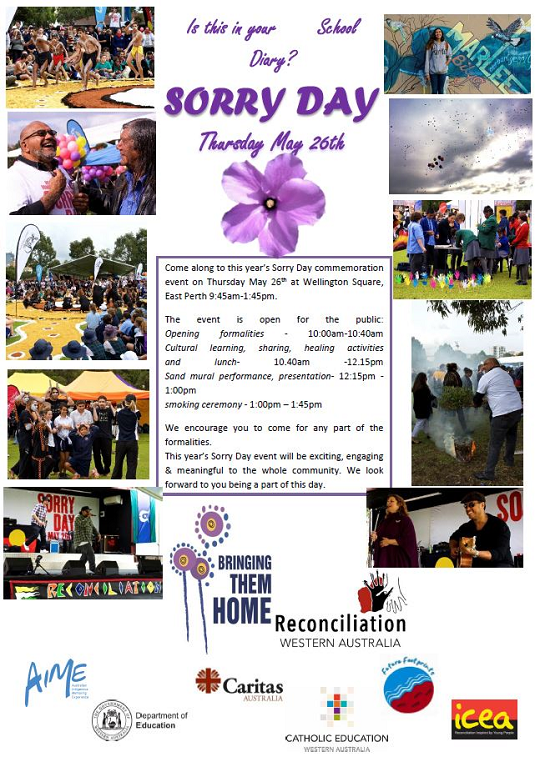 A Sorry Day Commemoration will be held on Thursday 26 May 2016 at Wellington Square East Perth, involving cultural learning, sharing and healing activities, a sand mural performance, and a smoking ceremony. Please see the flyer below for full details.